Our Farm is a diversified family farm located in the hills of Poland, Maine. Our farm focuses on raising market lambs, pigs, broilers as well as forage and vegetables all done so using sustainable practices. While this land was in agriculture over a century ago it had been reclaimed by the forest most likely around the time of the Second World War. In 2010 we built our home on this parcel and began the process of reverting it back to the productive agricultural land it once was. Our Farm is located at the peak of a large hill surrounded by hundreds of acres of mixed hardwood/softwood forest. The pastures of the farm are mostly less than 8 acres and separated by woodlands sometimes over 1/2 mile from the farm. The land owned by our family totals around 40 acres with over half of that in woodlot, however the expanse of what we farm covers an additional 40 acres. Most of the leased land we farm is utilized as pasture for ewes and lambs with some hay cut from it and an acre or less of forage such as turnips or corn. All of our livestock production models are based on raising animals outdoors on some sort of rotational schedule. We are able to minimize out inputs by utilizing grown forage/feed throughout the growing season and focusing on finishing animals early in the fall. We typically ship between 20-30 market lambs and raise around 200 broilers. We recently discovered that pigs are an excellent addition to our family’s farm as well. Last summer we raised a few for our customers and we were very impressed on the pigs’ ability to harvest many types of grown feeds. Because of the location of this farm within the surrounding woodlands, and the seclusion of some of our pastures, we have always incorporated in our livestock management plan animal husbandry practices to protect our farm animals from predation. Local predators include Coyotes, Bobcats, Bears, Fox, domestic dogs as well as eagles, hawks and owls. We have found that Livestock Guardian Dogs (LGD) provide a very dependable form of protection for our sheep. We keep one or two LGD with the sheep at all times. When weaning the lambs we will split our pair up, one staying with the moms and the other will spend the rest of the fall with the lambs. We also keep a couple farm dogs that live in the house but make their rounds on the farm marking and advertising their presence to wild visitors. I think the farm dogs are just as important as the LGD in establishing a territory corresponding to the farm borders. Our two LGD are a female Maremma/ Great Pyrenees cross and a Male Maremma; the farm dogs are a Border Collie and a Yellow Lab. We chose livestock guardian dogs, over Llamas or Donkeys, for the simple reason that I like dogs; I am comfortable caring for them and enjoy interacting with them. My opinion is that since Coyotes are our biggest predation threat and dogs and coyotes speak the same language, LGD may do a better job establishing a territory than other guardians, again this is my opinion. Our LGD establish their own territories within the very large territory of our resident Coyotes. Our dogs “speak” directly to our resident Coyotes, and the Coyotes know our dogs and understand the boundaries that they have established. No intelligent Coyote in its right mind would ever jump a four foot fence in the face of two vocally territorial LGD. Even in the dogs’ absence in a pasture, the boundaries appear to be respected by the Coyotes. An example of this respect was the time one of our sons and I were walking a back fence line during late winter. The snow was deep and a recent warm/cold trend made it possible for us to walk on top of the sometimes four foot drifts. We were following some coyote tracts that were on the outside of the fence line. At one point the drifts became so high that the fence was only a few inches tall. 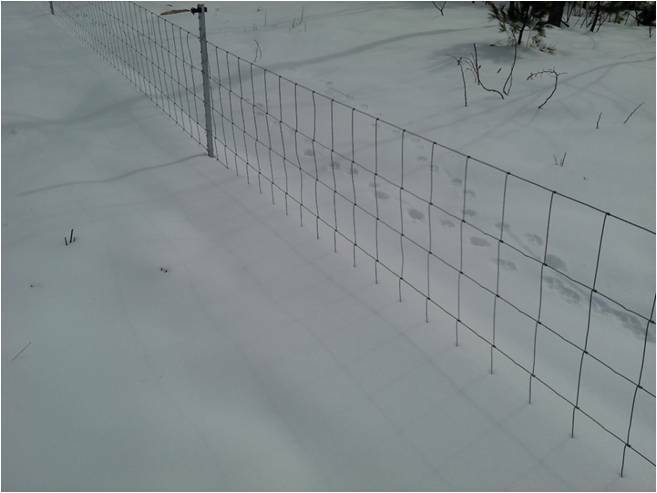 I was very surprised, and relieved, that the tracks continued on the outside of the fence, when they could have easily stepped over into the paddock where the ewes were wintering. It was late winter and Coyotes must have been getting pretty thin and they certainly knew they could have taken a ewe in the deep snow. There was no reason they should not have entered that paddock, but they didn’t. I can only assume that the Coyotes felt the risk of injury was too great if they entered what was our dogs’ territory. If a farm has questions about how we manage our farm to live with predators I would be very happy to communicate over Email or by Phone.